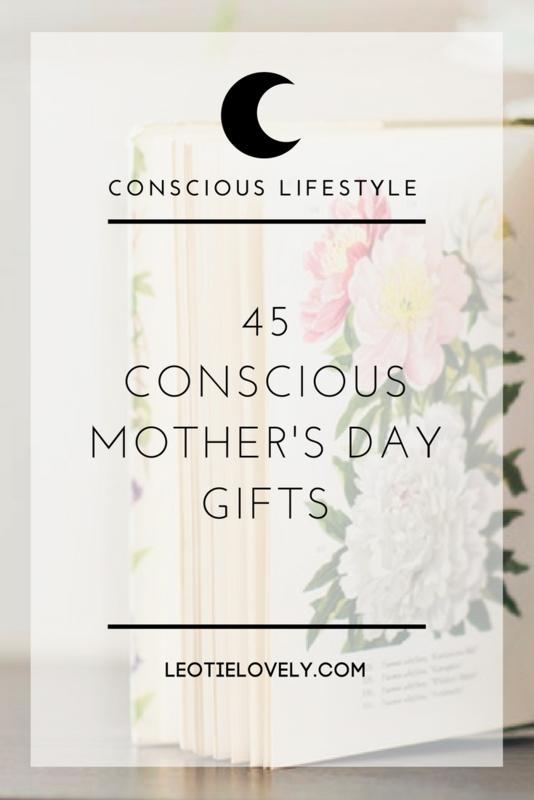 Below are a collection of gifts produced both ethically and sustainably which I've bought for others, for myself - and of course - for my mother. I hope you have planned some serene and connecting moments to share with the one who made you, in celebration of the life you were given and the fine woman who took the time to raise you. May your mama feel loved and adored on Mother's Day and every day forward, drenched in memories shared with you ... and perhaps the odd consciously collected gift as a souvenir of the sentiments you reign down on her. Guided by ethical and sustainable practices, Amour Vert—“green love” in French—creates a beautiful collection of core items which are easy to wear and style. 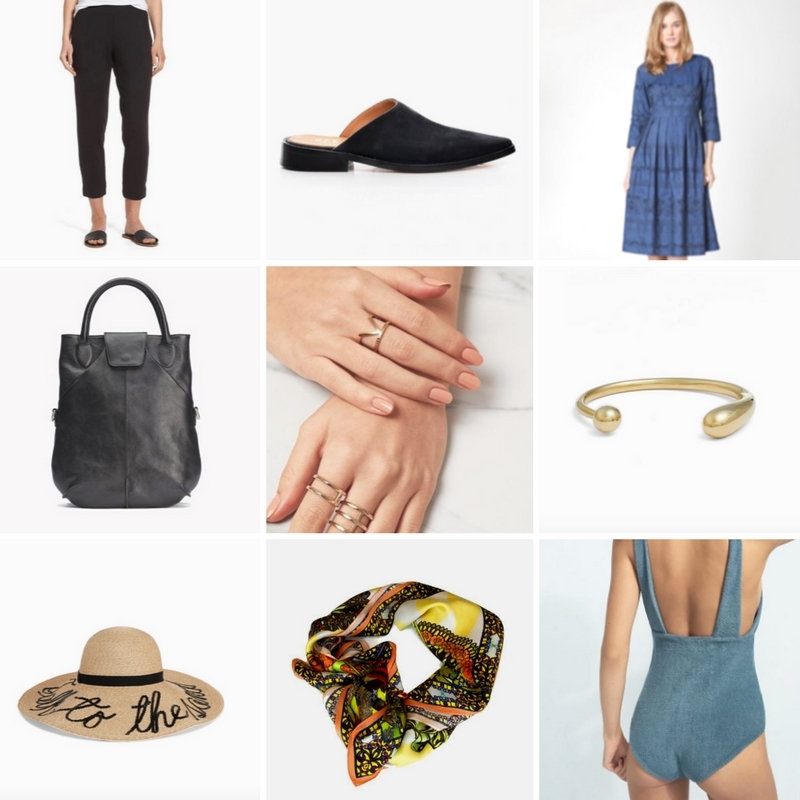 Using naturally grown bamboo, cotton, wool, tencel, modal and hemp, all free of harmful pesticides and chemicals and sourced responsibly, Thought Clothing creates each item ethically and consciously. 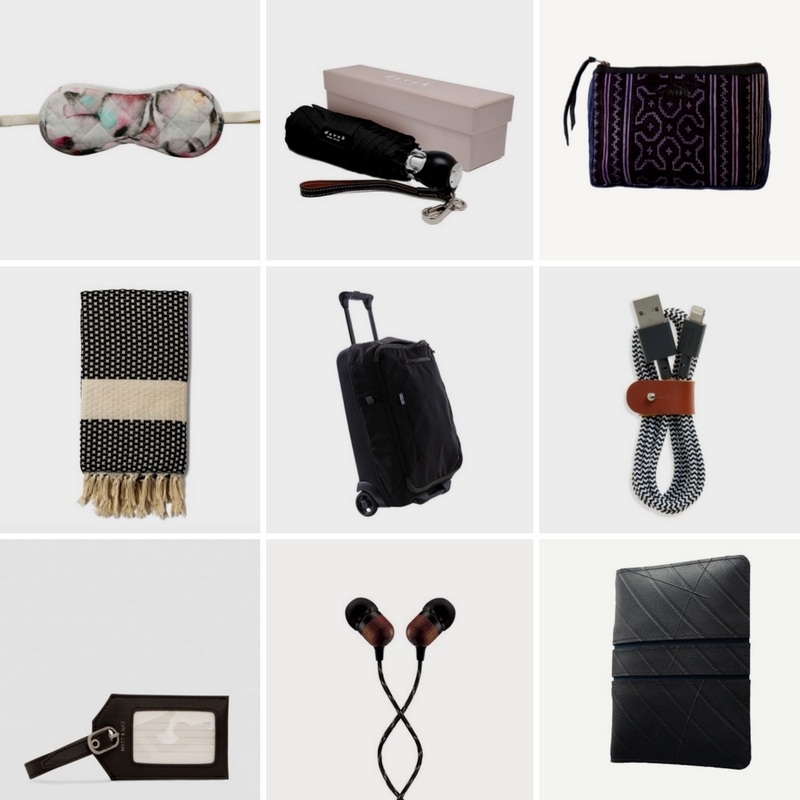 London based brand, Edge of Ember, works with global artisans to create a wearable collection of quality accessories. They're committed to fair trade practices which support traditional craftsmen in Indonesia, Thailand and Nepal. SOKO creates a beautiful collection of ethically handmade jewellery out of recycled brass. Handmade ethically by artisans in New York City, Eugenia Kim's creations cheeky notes of embroidered into each hat have made her a cult classic. Rather than imposing foreign designs on another culture, each piece from Victoria Road is designed by a local design team allowing for inspiration to be drawn from the designer's own cultural aesthetic and craft. Everyone in the production team works in Fair Trade workshops and are paid a living wage, receiving overtime pay, regular working day breaks, state pension fund benefits, and assistance with access to health care. I don't know about your mama, but I think mine should be flaunting her beautiful body in the summertime and this bathing suit, which is ethically and sustainably made, seems like a stylish and comfortable piece to do that in. This female owned and operated online boutique, based in Winnipeg, Canada, ships globally and specializes in luxurious ethical and sustainable lingerie and swimwear. Azura is my go-to for any intimates, swimwear or loungewear with their conscious collection of aesthetically pleasing gear. This unique bathroom accessory is made of natural volcanic pumice stone covered by hand-stamped copper and is ethically made in Turkey. Indigenous owned and operated, this Manitoba based Métis company produces moccasins and mucklucks. They produce their footwear at their Indigenous-owned production facility in Winnipeg, Manitoba (my hometown), providing opportunity through employment to keep the crafts of their ancestors alive (since I bought these 5 years ago, they've gone through such growth, they now only produce 20% of their product in Winnipeg). These beautiful soy wax candles come from a library of over 100 fragrances custom blended and ethically made in Charleston, South Carolina. to pre-consumer fibres and clippings that would otherwise end up in the landfill. Using only a smidgen of the energy and water needed to produce new cotton. 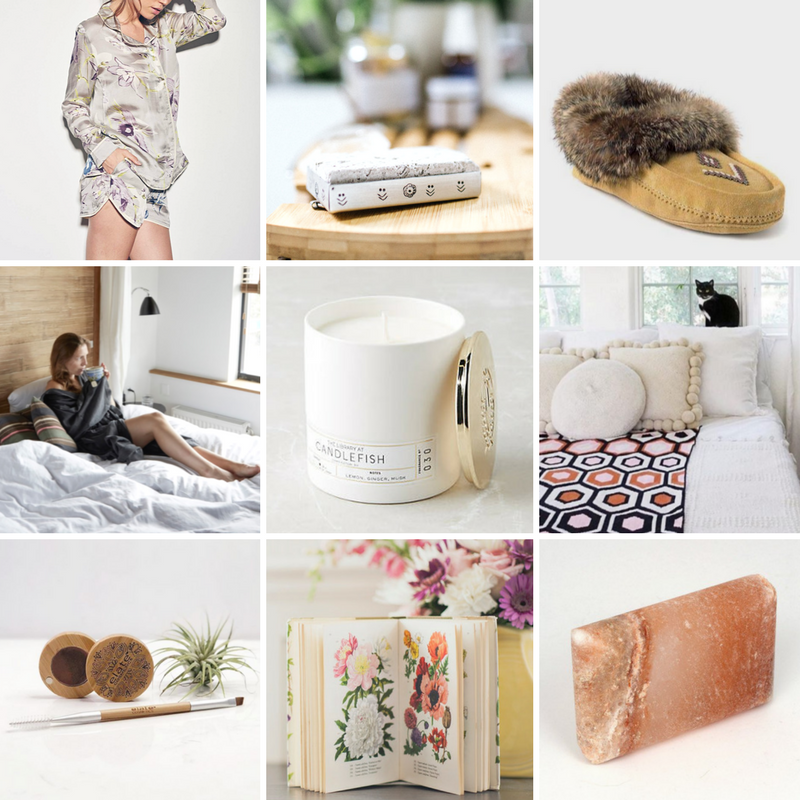 This Canadian female owned and operated clean cosmetics company has created a stunning set of ethical and sustainable cosmetics products and accessories which are vegan, cruelty-free, gluten-free, toxin-free, palm oil free, and housed in biodegradable or recycled packaging. Combining in the most beautiful and unusual way, feminism, ecological warriorship and the lost wisdom of the Celtic woman, this book moves you to the core. It is the single most inspiring book I've read thus far, political, spiritual and empowering, connecting us all with the ancient gynocentric mythologies our society has long forgotten. This non-lather beauty bar is rich in minerals giving you all the benefits of swimming in saltwater home. Global recipes from women for women, complete with beautiful colour imagery of the food and faces from Women for Women International—100% of the publisher’s profits go to WfWI. 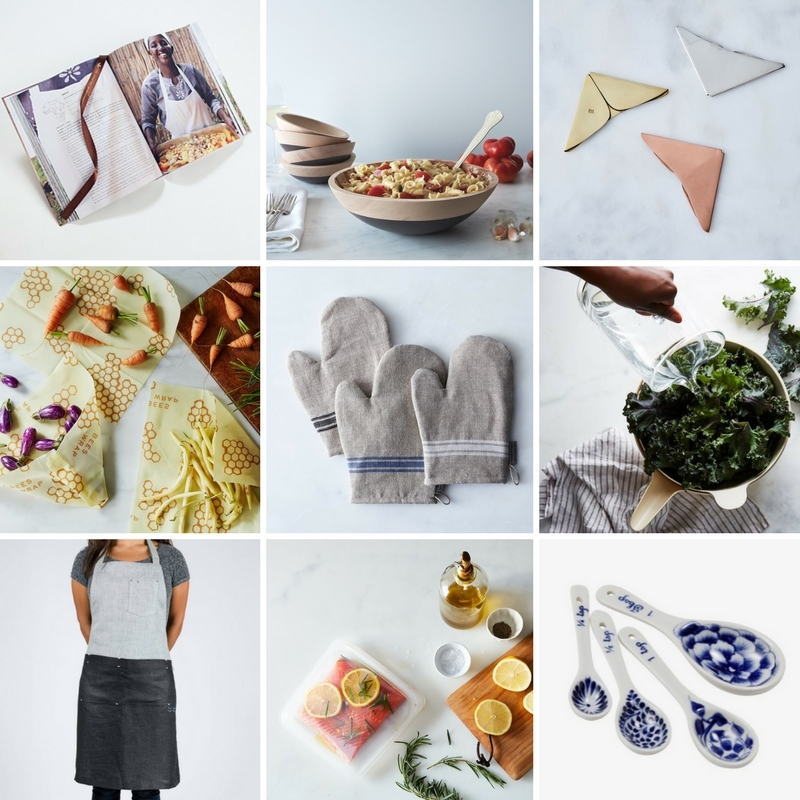 Treat your hard-working mama to a sous chef by signing her up to Green Chef. Each box contains 90% organic certified products with options for those who prefer gluten-free, paleo, keto and vegan diets, giving her options to try something different. A page holder that puts a rest to dog-eared corners in cookbooks and books alike. Made with either sterling silver, brass or copper. Reduce kitchen plastic waste with these handy wraps which can adhere to a large dish or wrap food just like plastic wrap would, only completely reusable. Created by a French linen goods maker who has been around for 150 years, these machine washable oven mitts are made from durable 100% Belgian linen which is strong, pill-resistant, and anti-mould and -moth. Reduce, reuse, recycle with this bamboo fibre colander-and-bowl set which allows you to collect the water you drain and reuse it and doubles as a handy mixing bowl as well. Made using 100% Irish Linen, this apron is built to last a lifetime. A reusable bag which can be used for overnight storage or marinades, free of waste and built to last. There's something special about measuring out your spices and potions with these hand-painted spoons that give the whole experience a measure of grace. These spoons are made using century old methods in the famous pottery village of Bat Trang, Vietnam, by artisans earning a fair wage. This collection of paper sacs are made from sustainable, lightweight textiles infused with a special blend of virgin pulp fibre and recycled felt which is manufactured through cultivation, not deforestation. The sacs are so flexible you can get them wet and reshape them like clay to your needs. Super useful for storing and shopping. The biggest environmental impact of disposables happens before you buy the product in its creation, but unfortunately, it doesn’t end there. Typically, disposable cutlery is made from a type of plastic known as polystyrene 1, more commonly known as Styrofoam, a product which is difficult to recycle. For this reason, whether travelling or wandering through everyday life, it's more sustainable to carry a spork. Avoiding single use items like tissues and napkins is a key part of going greener. These beautiful hand embroidered napkins are the perfect personalized gift to help your mama make a sustainable switch. 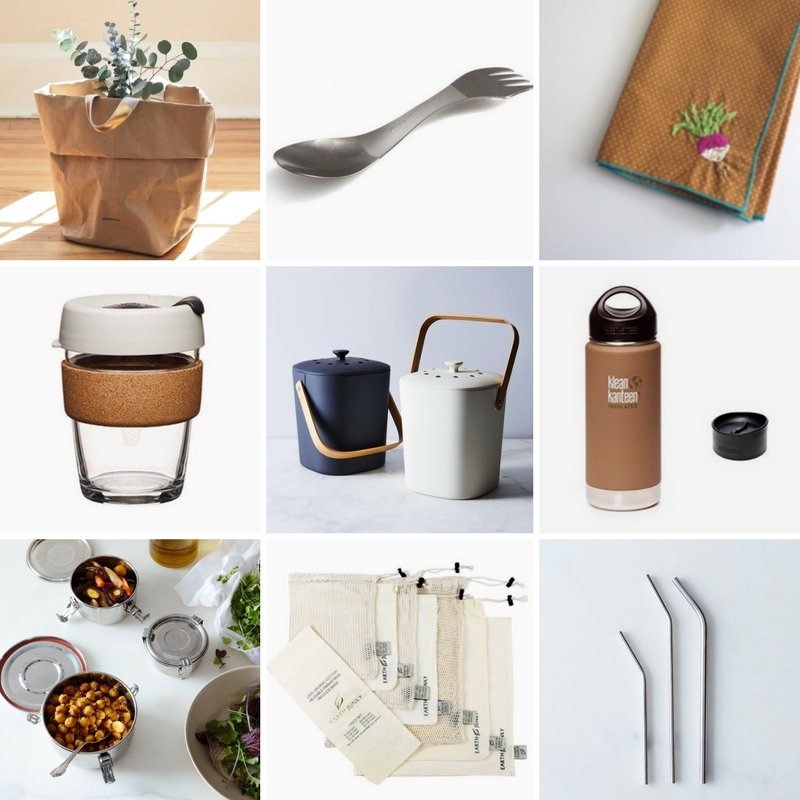 You can help your family members avoid adding to the heaps of coffee cups in our landfills by getting them one of these beauties to tote around. They’re stylish, practical and durable. Americans throw away $165 billion worth of uneaten food yearly. Because our landfills produce methane, which is a more harmful greenhouse gas than carbon dioxide, that's a big problem for the planet and its inhabitants. To battle this, composting is a huge help, and this bamboo compost is a stylish way to embark on that. Reduce plastic pollution and save your mama's health by gettting her a reusable water bottle to use instead. Reusable produce bags are an easy and effective way of reducing plastic and paper waste. Plastic straws have caused huge pains to animals, if you’ve seen this youtube video of a plastic straw stuck in a tortoise’s nose, you’ll understand why it’s such a selfish product for us to use. Straws are hugely harmful to the environment and to wildlife, yet each day we use 500 million straws, enough to fill over 46,400 large school buses per year. Getting a reusable straw for straw users mitigates that harm to nul. Made with 100% Lyocell Crepe, an eco-friendly fabric made from dissolving wood pulp which requires no chemical treatment in production, this Danish designed mask is produced ethically in India and is soft, light and cool, making it perfect for travel. Davek offers an umbrella that is made to last, each one produced with a steel and fibreglass reinforced frame and 190 thread count canopy. They come with an Unconditional Lifetime Guarantee, which means if your umbrella decides to flake on you, as so many of mine did, they will repair or replace it for free. This is, undoubtedly, a thoughtful and useful gift for anyone dwelling in rain-prone cities. Handmade in rural Thailand under ethical working conditions by artisans earning fair wages, these little bags offer bohemian patterns sure to brighten up your mama's day. Dedicated to creating Peshtemals, Luks Linen offers exceptional craftsmanship, done by artisans paid a fair wage, complete with a 20-year-free-fixing-guarantee for any natural deterioration of the product. Peshtemals are super diverse and can be used as towels, scarves, wraps, sarongs, throws, and knotted bags making them the perfect diverse gift to own or travel with. Most luggage is made from oil derived fabrics which won't biodegrade and produced in unsafe working conditions by workers who are unfairly paid. At the top of the carry-on game is Patagonia, whose creations are not only made with 9.25-oz 940-denier nylon CORDURA® Ballistic with a polyurethane coating and lined with 200-denier 100% polyester. Both fabrics have a DWR (durable water repellent) finish. Patagonia promotes fair labor practices, safe working conditions and environmental responsibility throughout their supply chain. Fabric wrapped chords, especially those that come with a chord tye like these ones, will last about three years longer than the plastic ones which come with our phones. Plus these fabric ones are a heck of a lot cuter. Rather than using and disposing of the paper tags made by your airline, get yourself a luggage tag for life. Made from sustainable materials and FSC certified woods, this company, created by Bob Marley's family, create headphones made to last. To top all their goodness, your purchases support the 1LOVE foundation which is dedicated to giving back to charities that empower individuals to take action for sustainable and responsible living. Make sure your mama travels in style with this eco, ethically produced passport holder made from upcycled tyre, that would otherwise have gone to landfill by artisans in Cambodia.